Kaiseizan Park (開成山公園) is one of the popular Hanami spots in Fukushima. It has over 1300 Sakura, Cherry Blossom in this park. At night, there is Yozakura, night sakura during the season. 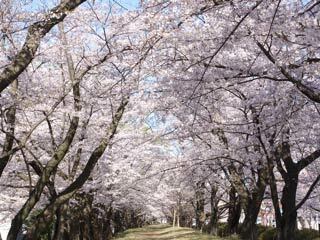 Sakura tunnel is very famous in this park. It's been used for movie making. This park is considered as the symbol of Koriyama City. This park was related with Asaka Reclamation, and about 4000 Sakura were planed by the pioneers. The park was built the pond for living. Today, there are all kinds of sports facilities, and play ground for family activities. Rose garden is popular as well.